Home | Practice Areas | Social Security | What Medical Evidence Is Required by Social Security Disability? You’ve decided to apply for Social Security Disability Insurance benefits or Supplemental Security Income benefits. There are some differences in the overall information you need to prove to the Social Security Administration (SSA) to determine your eligibility, but the medical evidence you need to supply for both programs is the same. Medical evidence is the pillar of the benefit claims process. When you file a claim, you are responsible for producing evidence that shows your disability and proves it is severe enough that it prevents you from working. Have a medical condition that is either diagnosed as terminal or will last at least one year and prevents you from working – short-term or partial disabilities do not qualify. There is a list of adult impairments you can check and see if your condition qualifies. When preparing your medical evidence, there are five main things that guide much of the information we will present below. Up to date: If your medical evidence is older than three months, or heaven forbid, older than a year, it could be a problem. Keep up with your medical appointments and scheduled tests. Adequate: Think specifics. Don’t just say, “Something fell on my head at work, and now I have a concussion.” You need MRIs of your brain, doctors’ reports on the injury and how it affected your ability to work. The more medical evidence of your injury, the better. Accurate: If you have injured your back, a report from a chiropractor won’t work. The SSA doesn’t consider chiropractors to be doctors. You need a full report from a medical doctor or vocational facility that documents the injury and all its effects. Your doctor: A report from the doctor who has treated you for years or the doctor you regularly see to deal with your work-related injury will carry significantly more weight with the SSA than a report from a doctor they have assigned to give you an examination. Hire a lawyer to help you: This step is the most difficult. A successful benefits claim requires a lot of paperwork and records. Studies have shown people who hire a lawyer to help them with their claim are three times more likely to have their claim approved. If you keep these five things in mind, you improve the chances of your benefits claim getting approved. What Is an RFC, and Why Is It Important? What Do I Do If I Don’t Have Any Medical Evidence? How Do I Submit New Medical Evidence? Everybody hates paperwork. But in this case, it is your best friend. The more medical evidence you can present, and the more thorough it is, the more likely it is your claim will be approved. Here are some examples of helpful paperwork to bring. Treatment and examination notes from a qualified doctor: Remember, your physician is best, or present notes from a doctor who specializes in the treatment of your injury. X-rays, MRIs, etc. : Include the images, as well as the analysis by doctors or qualified technicians. Patient records from any doctor you have consulted about your injury: This includes mental health records or any trips you may have taken to an emergency room. Don’t be shy about asking for them as soon as possible. Doctors can take a long time to provide them, and the SSA won’t make a final decision about appeals in particular if they don’t have this information. Records from any rehabilitation or physiotherapy treatments you may have received: These are not quite as powerful as medical records, but help you build a case that the injury prevents you from working. Keep copies of all your medical records and everything you get from the SSA about your claim. One of the other benefits of having your physician make out reports is that his or her records will go back beyond when your disability first started to affect you. Ability to show an onset date is important regarding back pay you can receive from the SSA. SSA will reward back pay of up to 12 months from the time you file a disability claim if you can show the disability affected you in the months before you filed. But now we face a tricky question: What if some of the medical evidence works against your claim? Do you need to submit that as well? How often have you seen this doctor? Was the doctor a specialist in your illness or injury? did you ask for a second opinion? The lawyer is not trying to avoid the report, but to find a chink in the report’s armor you can exploit during the hearing. 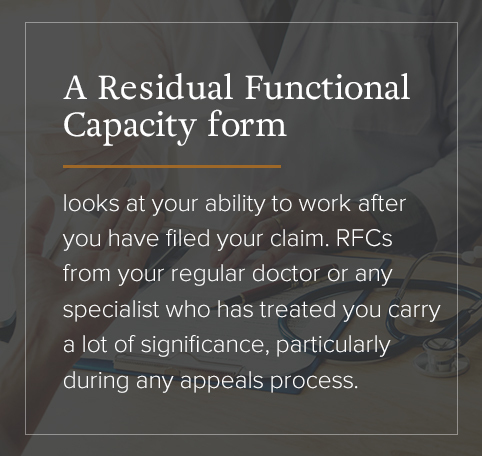 A Residual Functional Capacity form, or RFC, looks at your ability to work after you have filed your claim. It’s one of the most important documents the SSA uses to determine your claim. Keep in mind, the SSA will look for any reason to turn down your application. The success rate of initial claims is only 30 to 35 percent, even with good medical evidence. Once you have filed your claim, you cannot do any work. You can’t cut lawns in your neighborhood for a few bucks, you can’t take a shift at the corner store, you can’t deliver newspapers. Nothing. The SSA will seize on any sign you can still work in a meaningful way to deny your claim. The purpose behind the RFC is to demonstrate to the SSA that your disability turns simple tasks into tough ones. RFCs from your regular doctor or any specialist who has treated you carry a lot of significance, particularly during any appeals process. Your treating physician knows you and can provide the best evidence your illness or injury has impacted your ability to work. Appeals judges prefer them to an RFC filled out by a doctor assigned to you during the hearing process. Please make sure you get your doctor to file out an RFC for you, especially if you appeal a claim. For people who lack medical evidence to back their claim, having a good disability lawyer can help you the most. Sometimes people just don’t have medical evidence, and the main reason is a lack of insurance, or a period when you didn’t have any insurance. Moving is another reason people may lack evidence that covers the period of their disability, since it can affect the time when people have a regular doctor who can provide important medical evidence. You do not want a claims examiner to have only a medical report from a physician they have assigned to examine you. Your chances of success are slim in this situation. Often, you will need proof of your disability for your employer or to take advantage of any program offered to those receiving benefits. For example, in Pennsylvania, you need proof of disability to take advantage of the Property Tax Rent/Rebate Program. An agency will ultimately decide what kind of documentation it will accept. But the examples that follow are widely accepted as proof of a disability. If you are having any problems obtaining these documents, your disability lawyer will assist you. If there is any change in your medical condition after you have filed a benefits claim, it’s important to inform the SSA as soon as possible. This rule also holds true if your benefits claim has been approved. If your condition worsens during the claims process, an updated note from your regular doctor or your specialist concerning these changes improves the chance that your benefits claim will be approved. If the change happens before you are assigned a claim examiner: You can mail evidence of the claim to your local SSA office, or take it there yourself. If the change happens after you’ve been assigned a claim examiner: The letter you received from the SSA after you have filed a benefits claim will include the name of the person assigned as your claims examiner and how to reach him or her. You should mail it to them directly. If the change happens when you’re appealing: Submit the evidence of the worsening of your condition, along with the paperwork for your appeal. If the change happens after the approval of your claim: Whether your condition continues to worsen or to improve, you must report any change to the SSA. The documentation you receive from the SSA will include the information on where you can report these changes. Keeping the SSA informed about your condition is necessary, especially if you want to continue to receive your benefits. Remember, the SSA will check every three to five years to see how you are doing. Keep a file at home with copies of all the paperwork and medical evidence you have submitted to the SSA so you can refer back to it anytime. Solid medical evidence provides you with the best chances of a successful benefits claim. But nonmedical evidence may help build on the medical evidence. For instance, keeping a daily journal of your condition adds to the credibility of the report from your medical doctor. Don’t just do this now and then. Be consistent. A claims examiner or an appeals judge will look upon your claim more favorably if you present them with a written record that shows you have been in pain and unable to work. Also, think about including written statements from friends and family who can testify to how your injury or illness prevented you from working. Along with medical evidence from your doctor or specialist, these statements show how your disability affected your day-to-day life. If you or your lawyer believe this tactic may help your case, make sure your witnesses include contact information like addresses and telephone numbers, and the best times to reach them. 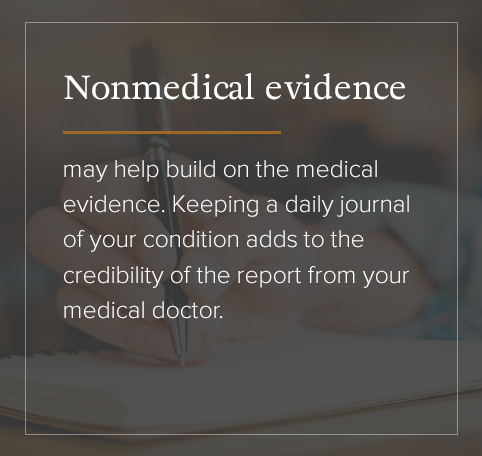 The nonmedical evidence is not as critical as medical evidence, but it can add credibility to your benefits claim. Talk to your disability lawyer about whether or not they think it will help. As we noted above, studies have shown hiring a lawyer to help you with your benefits claims triples your chances of success. At KBG Injury Law, our staff of accomplished lawyers has many years of working successfully on benefits claims. Our goal is to treat all our clients with the respect they deserve. We understand how challenging the disability claims benefit process can be, and we also understand how difficult and stressful it can be for you and your family emotionally and financially. If you’re interested in filing a new benefit claim in Pennsylvania, we invite you to accept our offer of a free consultation. Whether you are starting a new claim, or require immediate assistance with the claim you’ve already filed, you can reach us 24 hours a day at 800-509-1011. Or, you can visit us on the web, where you can request a free consultation as well.